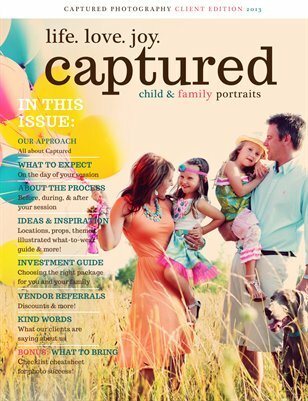 Captured Photography takes a relaxed and soulful approach to creating heirloom imagery for individuals and families. We love to photograph you in beautiful, meaningful settings that convey the essence of who you are and what you love. We work hard to make sure the entire process is stress-free for our clients from start to finish, with the end result being beautifully crafted photo prints and products to be treasured for many years to come. Captured has been taking professional portraits since 2007 for a wide variety of clients. Many of the people we photograph become our friends for years to come. We completely and absolutely love what we do!